There are a lot of things that we’ve learned over our years in the janitorial business. One of them is this: Unless you are actually part of a custodial cleaning company, you don’t want to be in the janitorial business. That’s because, if you’re not in the janitorial business, being in the janitorial business is a waste of your time. Here’s the point: If you’re managing commercial or government facilities, there are an unending number of things that demand your attention. From communication with tenants, to building technology systems, to leadership and strategy, you’ve got a lot of things to think about. Janitorial work shouldn’t be one of them. Instead, you need to be able to trust the janitorial company that you hire to clean your facility to do their job well. When you entrust the cleanliness of your facility to them, they need to come through – with thoroughness, quality, and consistency. If your custodial company doesn’t do that, you’ll find yourself spending more time than you’d like thinking about the janitorial business. Here are three signs that you’re too involved in the janitorial business. 1. You often wonder whether the facility will be clean today. How often do you wonder whether or not your facility will be clean? If the answer is “never”, then your cleaning company is doing their job well. If the answer is anything else, you may have an issue. Do you find yourself wondering if the trash will finally be emptied today – or if that spot above the cabinets will finally have been dusted the next time you check? If that’s the case, you need to speak with your custodial cleaning company. 2. You (or your tenants) end up doing the cleaning. Even worse than wondering whether or not things will be clean is having to clean things yourself (or having your tenants clean things). If you or they are regularly doing things like dusting, taking out the trash, or mopping spots on the floor, that’s not a good thing – and you need to stop. If you look down and are holding a mop, you know that you’re too far into the janitorial business. Get out while you can. 3. Tenant complaints don’t go away. 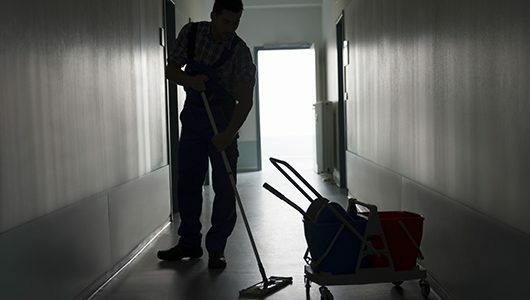 Finally, you know that you’re too involved in the janitorial business if tenant complaints don’t go away – because that means that you have to spend time thinking about them. We’ll be honest – as a commercial cleaning company in Maryland, we’ve cleaned millions of square feet over the years, and we’d be lying if we told you that we’d never received a single complaint. Complaints happen. Sometimes tenants are being a bit picky, and sometimes there are issues that need to be addressed. Here’s the thing, though: a good custodial cleaning company will find a way to make tenant complaints go away quickly. If your tenants mention a cleanliness concern, it’s a cleaning company’s job to address it right away and in as thorough a manner as possible – and to make sure that it doesn’t happen again. At The Wilburn Company, we recognize that nobody’s perfect, and that even the best cleaning companies make mistakes. Custodians may occasionally miss spots. It happens. We take pride, though, in providing service that is systematic in its quality. It’s why we require our staff to complete a comprehensive training program with annual requisites. It’s why we have Quality Control inspectors and managers assigned to every client we work with. And it’s why we’re so quick to address any tenant complaints, with accountability going all the way up through management. We know that nobody’s perfect, so we’ve designed a custodial system that minimizes mistakes by maximizing accountability. In short, we’ve put a lot of time and thought into creating a high quality janitorial business, so that you don’t have to spend any time thinking about the janitorial business yourself. Are you ready to get out of the janitorial business? Get in touch with us. As a commercial cleaning company and secure cleaning company serving the Maryland and Virginia areas, we’d love to hear how we could help. Contact us online or at 410-789-3320.